Let me first start by explaining two phrases I’ve used several times throughout this devotional: “AGE TO COME” & “MILLENNIUM”. MILLENNIUM: It is a term that speaks of a literal 1,000 year period in which Jesus rules the earth in person. At this time the Kingdom of God is openly manifest worldwide affecting every sphere of life (political, social, agricultural, economic, educational, media, arts & technology, etc.) Jesus will replace every surviving wicked king (leader/president) of every nation on earth with godly leaders who will pledge their allegiance to Him and the resurrected saints will be appointed to oversee cities, regions, nations and even continents reporting directly to Jesus. This period of worldwide blessing is initiated by Jesus’ Second Coming, at which time, God binds Satan resulting in a 1000-year period of peace, righteousness, prosperity and unprecedented blessing for the whole earth as Jesus restores life to conditions seen in the Garden of Eden (Rev. 20:1-6, Isa. 2:1-4; 9:6-9; 11:1-16; 51:1-8; 60-62; 65:17-25; Ps. 2:6-12; 110:1-7; 72:11, Dan 7:27, Mt. 5:5; 6:10; 17:11; 19:28, Acts 1:6; 3:21, 1 Cor 6:2-3). This is what Jesus is fighting for on your behalf; you reigning with Him in the age to come. This is NOT a way to establish your honor before men or by being over people as way of comfort but rather by being where He is and doing what He does because it’s the purpose for your existence; the reason why you are still alive today. He’s looking, preparing, and choosing people who are yoked together with Him. 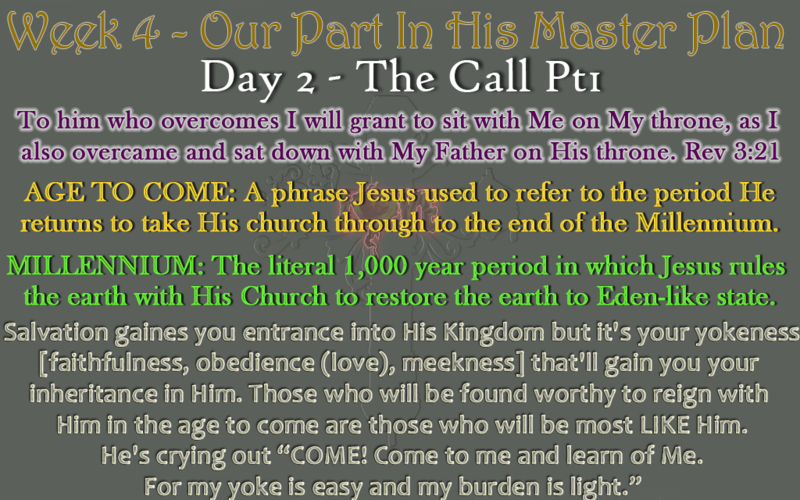 Your salvation gained you entrance into His Kingdom but it’s your ‘yokeness’ [faithfulness, obedience (love), meekness and overcoming attitude] that’ll position you close to Him. Those who will be found worthy of reigning with Him in the age to come are those who will be most LIKE Him in this age. The reason He hasn’t put everything to its end is because His house is not full; there are many thrones still empty needing of people who will be found worthy to sit on them. This is His call to all His children. He’s crying out COME! Come to me and learn from Me. For my yoke is easy and my burden is light. Yes! It will cost you; It might cost you your pride, your earthly reputation, your right to freedom* and possibly your very natural life. Count the cost and if you deemed ME worthy, COME! COME and learn of my MEEKNESS! COME and learn of FAITHFULNESS! COME and learn of my OBEDIENCE! COME and learn of my LOVE! COME and learn of my perseverance and endurance to OVERCOME! COME and yoke together with ME; for I desire to share my HEART and MY THRONE with you. FOR MANY ARE CALLED BUT FEW ARE WILLING TO GIVE THEMSELVES TO BE CHOSEN. “Look, I am coming soon! My reward is with me, and I will give to each person according to what they have done….